Naut Humon has been the Director of International Creative Operations for the RML CineChamber, Asphodel Records and AV curator for select portions of the annual ARS Electronica Festival in Austria where he also acted as the main American coordinator for their Prix Ars Digital Music and Sound Art jury category for a full decade. Recombinant Media Labs (RML) emerged from Humon’s lifetime of performance exploration and cross media cooperations. 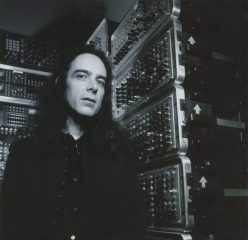 By the eighties, Naut Humon and his constituency had built up the warehouse known as the Compound where the experimental group Rhythm and Noise was spawned, initiating many of the core elements that led to forming the globally distributed Asphodel recording label which fostered projects ranging from DVD chamber orchestra renditions of Lou Reed’s Metal Machine Music (with Lou himself playing with the group Zeitkratzer) and the eminently compelling CDs of Mix Master Mike, Diamanda Galas, Rhythm and Sound, Tipsy, Iannis Xenakis, Christian Marclay, John Cage and Maryanne Amacher amongst many others. Within this structure, the RML consolidation was substantiated as a culturally coherent enterprise, hosting a vast range of visual artists, musicians, engineers, designers, curators, organizers, technologists, educators and theorists from around the world.